When having 21st century comforts and devices is a must on holiday, KUMA has the solution. A newcomer to the leisure industry, KUMA (pronounced 'koohma') was established in 2013. Yet, within a short space of time, this relatively small company has managed to make a name for itself. KUMA WiFi boosters and kits, along with other brilliant KUMA products, have propelled this company's reputation as a market leading manufacturer of mobile internet connectivity products for the leisure industry. From its headquarters in Hereford, KUMA stands at the forefront of leisure innovation. Its research and design team come up with clever new products each season, including speakers, aerials, and WiFi hotspot boosters. In collaboration with distributors in Indonesia and the UK, KUMA deliver products that enable tourers to connect and keep in touch with family and friends from across the planet. With state-of-the-art manufacturing facilities and a suite of industry allies the likes of telecommunications company Three, KUMA offers you internet and TV access instantly, efficiently, and reliably. 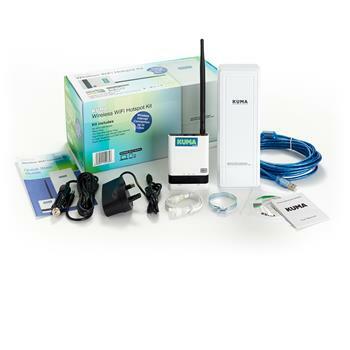 Whether you're away for weeks on end, or you simply need to keep an eye on your office inbox over the weekend break, count on Kuma WiFi kits and boosters for 3G and 4G connectivity. Touring the world by caravan, motorhome, campervan, or boat has never been simpler or more rewarding. Kuma products give you the peace of mind that comes with knowing you're never more than a click away from your loved ones or the service providers you need. What's more, you can rest assured you'll never fall behind on work or other commitments with so much information at your fingertips. Get your KUMA WiFi kit and carry out your day-to-day tasks just as you would at home; better yet, put your feet up and enjoy your favourite streaming services with cheap top-ups any time you want. KUMA products can do all this and more. Why not replace your fiddly old aerial with a no-fuss omnidirectional one from KUMA? You'd never need to readjust it or switch between analogue and digital channels. What's more, some KUMA products pick up digital, analogue, and even radio signals thanks to built-in high-gain level. Receive all your favourite FM radio station signals through 360° reception. To top it off, every KUMA aerial available at Leisureshopdirect comes with high receiver sensitivity and very efficient signal amplifiers. Say what you will of these newfangled KUMA aerials, but they make for a very relaxing holiday with all the soaps, sports, and news you want at the push of a button. How about a portable 4G antenna to use and share your internet connection with up to 5 devices? Do you need to fit a camera in your horsebox that you can monitor remotely? KUMA WiFi comes with free data and cheap top-up. Do you need to keep an eye on your caravan or home while you're away? KUMA WiFi enables you to watch over your belongings wherever you may be in the world (provided you set up a camera kit). Thanks to the KUMA hotspot booster kit, downloading and uploading large amounts of data quickly on the campsite is now a possibility. Or mount a flip-down bracket onto the ceiling or under the kitchen cabinet to tuck your TV away when you're not using it. Made of high-quality materials and designed to save you as much space as possible, KUMA's rotating bracket is ideal for static and mobile settings alike. Watch your favourite shows, films, slideshows, or presentations everywhere: at home, in your campervan, and even at work. KUMA ceiling TV mounts will not disappoint. Browse the Leisureshopdirect catalogue for fantastic devices suitable for house, caravan, motorhome, boat, or horsebox that make self-sufficient holidays truly enjoyable for the entire family. Then come back to our website regularly to find the latest KUMA products, and don't hesitate to send us your queries and requests for KUMA accessories.